My grandfather spends a minimum of P60.00 everyday for lotto. He used to walk 3-4 kilometers just to buy his lotto tickets but now that he's 92, he asks my dad or my uncle to buy his tickets for him. The biggest amount that he has ever won was P25,000.00. But regardless of amount he wins, he always shares his cash prize to my dad and his beloved apos (grandchildren). My dad told me a story about my grandfather that he will never forget (I don't think I will too). 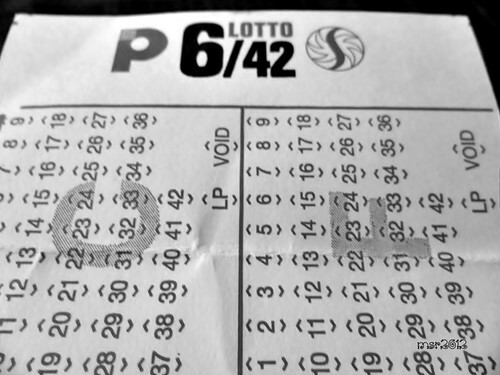 Lolo Berio does not ask for money for his lotto tickets. He believes it will bring him bad luck. So in order to have money to buy his lotto tickets, he would sell scrap and not-so-scrap-yet materials found in our backyard and garage. My dad keeps his hand tools in a locked cabinet because if Lolo Berio sees it lying around, he would think that nobody owns it and he can sell it. Haha! One day, they couldn't find Lolo Berio. They looked in his room, garage, backyard.. they can't find him. That has happened several times. One time, a neighbor told us that Lolo Berio (who has a hearing problem but refuses to use his hearing aide) was hit by a jeepney on his way to the Lotto center. Good thing the jeepney driver brought him to the hospital and he was not badly hurt. My dad decided to go out and look for Lolo Berio. My dad was so worried he drove around the area to look for his father. My dad saw him at a waiting shed of a nearby village. Lolo Berio told my dad that he is waiting for his P65.00. Confused, my dad patiently listened to his dad's story. Lolo Berio sold scrap materials worth P65.00 but the boy he sold it to told him that he only has P100.00 and does not have change. The boy took the scrap materials and promised Lolo Berio that he will be back to give the P65.00. The boy never came back. Lolo Berio has been waiting for hours. He wouldn't leave the waiting shed. My dad offered to give him P65.00 but he said he wants his money. My dad asked Lolo Berio to join him in the car to look for the boy he sold his scrap materials to. Lolo Berio agreed but my dad knows they will not be successful in finding boy or his scrap materials. They drove around our village and some nearby villages. Lolo Berio is the sweetest and most generous man I know. How could someone do this to an old man? For P65.00?! I realized that I am just like the boy who deceived Lolo Berio. I sin everyday. I replace God with material things, temporary pleasures and happiness and the things that I need to do. I am so busy with my schedule at work and at home that I forget about praying and praising Him. I am so preoccupied with worldly things that I forget about living in ways that is pleasing to Him. Despite all this, God patiently waits for me to come back and repent. Sometimes, it is easy for us to hurt other people and disregard their feelings the same way that we hurt God and disregard His love. As I draft my 2013 Wish List and To Do List, I will put "Relationship with God" on top before everything else. Because if we put God at the center of our life, everything will fall into place... according to His will and His loving plan for us. What's on your 2013 Wish List and To Do List? How do you plan to strengthen your relationship with God?